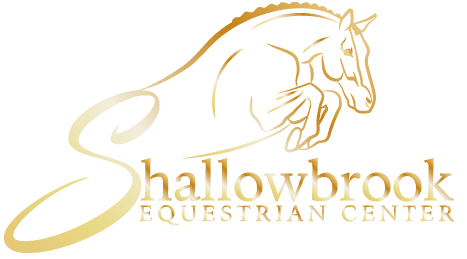 At Shallowbrook Equestrian Center, all students, whether beginning or advanced, are encouraged to develop their personal horsemanship skills. If you’ve never touched a horse, we can help you gain the confidence and skill-set required to handle them. If you haven’t ridden in years, we can help you regain your confidence, skill-set AND fitness. With a combined experience of more than 50 years, our team of horse professionals are well qualified to take your riding to the next level. Our beginner students will learn how to properly handle a horse on the ground, not just ride. Our intermediate to advanced students will have a riding program tailered to meet their goals. Like any sport, progress comes with practice. For this reason we strongly encourage riders to participate in regular lessons. Our horses and ponies are well-schooled and well-cared for; they will help you achieve your personal riding aspirations. Below is a list of riding attire suggestions and safety considerations that will help you get the most from your lessons. We are dedicated to making your riding experience both safe and enjoyable! Helmets are required. Safety is the top priority in our riding lessons and students must wear a helmet at all times while on a horse. If you have your own ASTM approved riding helmet, please bring it. If not, we have approved helmets for students to use during lessons. Bicycle helmets and other helmets not designed for horseback riding are not allowed as they may not withstand the impact of a fall. Boots with at least a 1″ heel are preferred. Please do not wear tennis shoes, hiking boots or sandals! If you do not have appropriate riding boots, please contact us and we will be happy to assist you with recommendations on where to purchase them. Breeches or jeans are required for riding. Pants should not be too baggy or loose, the same applies to tops. Please do not wear any loose jewelry, such as long earrings, bracelets or necklaces.